Everyday my diet pushes further in a vegetarian/vegan direction. I don’t know if it is because I am older, my tastes changing, or maybe I am I just tired of all the same foods I have spent life eating. If I really think about it, which I am prone to do, I don’t think I eat this way to be healthy. While health is a byproduct and one I will take, I think it is because I am a lover of food. As one whose tastebuds have been around the block a few times I am always looking for the new and exciting to try. As my tastebuds gain experience it also becomes harder to get excited about food. It might be connected to my garden too. I have been lucky enough to have a garden of some sort for well over 15 years now. With each passing year I get more excited about the growing season. It gets harder and harder to wait for the first produce. The other thing I know is the diversity of vegetables I grow has increased the diversity of my diet. For whatever reason and it does not matter to me, I have developed a fondness for vegan food. 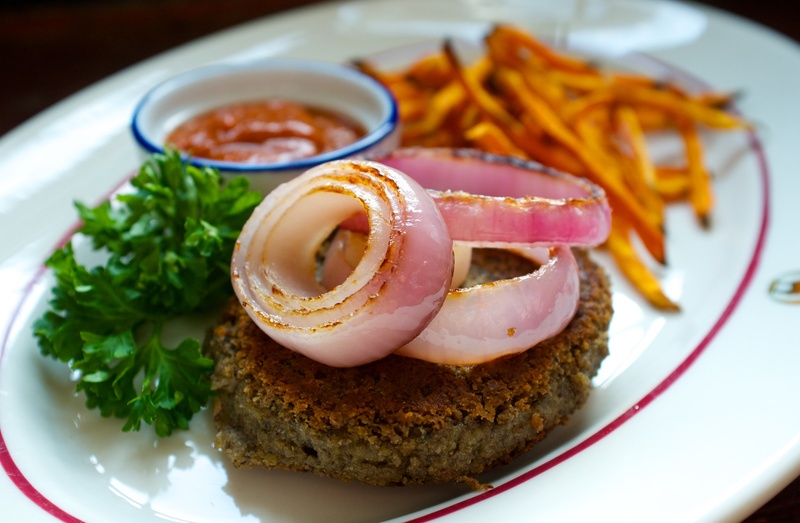 I make these lentil patties often with my lentil patty tikka masala recipe. Today I cooked the lentils in cashew cream and added lemon juice and thyme. Get the lentil patty tikka masala recipe here. Heat the oven to 425˚ F.
While the oven is heating place a saute pan over medium heat. When the pan is warm add a couple of glugs of oil. Add the slices of onion and saute them until they have browned. Remove from the heat. Toss the sweet potatoes with oil. Season them with plenty of salt and pepper and toss them again to mix in the seasoning. Lay the fries out onto a baking rack set over a baking sheet. This will allow the heat to cook the fries from all sides(do this step or you will have limp fries). Bake the fries until they begin to brown and blister, about 20 minutes. Remove one of the largest fries and test it to see if it is tender on the inside. Be careful sweet potatoes burn easily so keep an eye on them. Warm the onions in the oven. Top the patties with the onion rings, serve with fries and curry ketchup!